Is the world's best pop band from Scotland? 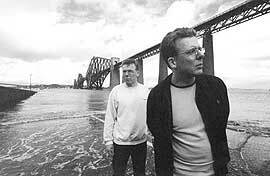 Mention the Proclaimers to the average American and they'll most likely start giddily intoning, "And ah-HYE would walk 500 miles, and ah-HYE would walk 500 more ..." while making goofy faces, as if trying to entertain a toddler. That is, if the name doesn't elicit a blank stare of non-recognition. 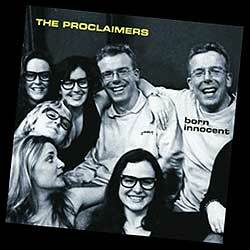 All of which is truly a shame, as the Proclaimers  best known on these shores as the one-hit wonders responsible for 1993's silly-but-infectious "(I'm Gonna Be) 500 Miles"  are rightfully revered as cultural/musical deities in their native Scotland, and may well be the best pure pop band in the whole darned world. 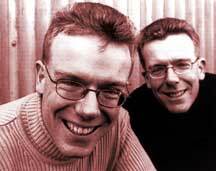 Fronted by identical twins Craig and Charlie Reid  who admittedly are goofy-looking with their thick spectacles, close-cropped, retro haircuts and ever-present, toothy grins  the Proclaimers' domestic Q factor has been stymied by many issues: accents thicker than Bill O'Reilly's forehead; American radio's disinterest in thoughtful, intelligent pop music; and the band's less-than-prolific track record (with a scant half-dozen CDs released since their 1987 debut). Yet any self-respecting music fan who doesn't find themselves singing along and dancing dizzily to the Proclaimers' new album, "Born Innocent," best check their heart for a pulse and their innards for a soul, as this is perhaps the most thoroughly enjoyable, sharp and filler-free pop record to surface since back in the days when the Beatles, Byrds and Beach Boys were omnipresent on the airwaves. From anthemic rockers like "Born Innocent" and "Blood On Your Hands" to Everly-esque harmony-pop such as "Unguarded Moments" and "Redeemed"; from the bawdy skiffle of "Role Model" to the gorgeous country/r&b balladry of "No Witness" and the perfectly sublime cover of the Vogue's "Five O'Clock World," this is a five-star effort from top to bottom, good to the last drop, life-affirming, gorgeous. The Reids largely came to their artful, idiosyncratic sound like any self-respecting European group: through early exposure to classic American music. "That's the type of stuff we've always liked  rootsy, simple chord progressions, mainly based around American folk and popular music," says Charlie. "Growing up, our early influences were mostly from my dad's record collection. He liked guys like Ray Charles and Fats Domino. There was also some classical music and some country, he liked Frank Sinatra, he had pretty Catholic musical tastes. We were born in 1962 and so we also came up listening to the Beatles and the Stones on the radio. Then in the late '70s we started getting into the punk bands in Britain at the time. But I suppose when you get right down to it, the biggest influences were American  folk music, country music, Appalachian harmony groups. My favorites have always been people like Johnny Cash and Merle Haggard. And I really liked the Motown and Stax stuff, guys like Sam & Dave, you know? I think that's why this record works for me, this is the rawest record we've done. It suits us and it suits our voices." Raw, real, rockin,'  "Born Innocent" is all that and more. According to Reid, that's largely due to exclusively using the brothers' own touring band for the making of this album  bassist Iain Nico Bruce, pianist Stevie Christie, drummer Ross MacFarlane and guitarist Stuart Nisbet. 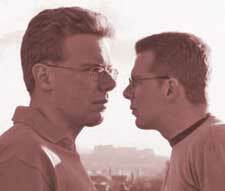 Curiously, this is a first for the Proclaimers. "I think using our band been very beneficial for us in the urgency of the sound," says Reid. "There used to be pressure to [use studio musicians]  sometimes subtle, sometimes not-so-subtle. We'd always used our band on bits and pieces but it was never all our own thing. I think this record represents who we are at this stage in our career better than any record at any other time. To me, music has to sound authentic. It doesn't matter if it's Irish folk music authentic, Appalachian authentic or if it's authentic blues or whatever. It just has to sound like it's sincere." That concern with sincerity is most evident in "Blood On Their Hands," an oddly upbeat and tuneful diatribe against terrorism, pointedly skewed against Muslim extremists, rife with allusions to martyrs washing blood from their hands in paradise. To Yanks who fear that Europeans don't take the threats of a post-9/11 world seriously, for those who worry about continental appeasement, the track will be most comforting. "I can't understand anybody who can believe that they're doing God's will when they go blow up a bus in Jerusalem or walk into a train station in Spain and blow themselves apart," Reid opines. "I cannot ... I will not ... nothing in my culture and the history of my people taught me any way I could identify with that. I can identify with people saying, 'I've taken enough, I'm going to fight back,' but I don't see how you can fight back by blowing women and children up. It is totally immoral, and the people who fund it, the people who send guys out to do that and say it's for a moral reason, I ... I ... cannot understand that, and I loathe them, I hate them." While the subject matter on "Born Innocent" runs from grave to tender, these heavier elements are offset elsewhere by the Reid's patented humor, melodic brilliance and playfulness. The thickness of their Scottish accents alone is enough to tickle most Americans' funny bones, but the brothers would have it no other way. "When we started playing in bands it was the late-'70s/early-'80s thing in England, there was this Johnny Rotten kind of cockney drawl thing going on," Reid recalls. "Before that, most people had tried to sound American or mid-Atlantic. With us, we were singing about our own lives and our own country and it seemed not right to do that and try to sound like something other than what we were. Basically, we adopted the style you would have used if you were singing a Scottish folk song. It's just that instead of using that on a song from 200 years ago, we'd use it on a song we'd write ourselves. That approach always suited us." If it suits the brothers Reid, it doesn't seem to have suited American radio, which continues to shun every record released by the Proclaimers in the wake of the success of "500 Miles." But, true to form, the group soldiers on for the faithful all over the world, particularly in the Australia, the U.K. and Canada, where ears and airwaves are more receptive to simple, honest pop music. The band even headlined a recent outdoor festival in their homeland, which drew more than 100,000 fans. "It's difficult in the Clear Channel world, where a small amount of people decide who's going to be on the radio," Reid laments. "Truthfully though, I don't worry about it too much. We're going to do the kind of records we want to do and hope that people like it. That's always been the philosophy  do what you want to do and hope people like it  and up to now, it's worked.